Finding out that you're going to be a parent is both exciting and terrifying, and we see the full range of those emotions from Bernadette and Howard on The Big Bang Theory Season 9 Episode 16. This is honestly one of my favorite episodes The Big Bang Theory has ever done, and I feel like that's something I've been saying a lot recently. After a rocky start to the season, I'm glad this is the direction that we're headed. Bernadette's way of breaking the news to Howard is endearing and fitting for them as a couple. Post-it clues? That's adorable. It's not surprising that Howard's excitement is quickly following by a complete freak out, though. He worries about everything from the logical and even endearing issues to the fact that the nanny can't be too pretty or it will wreck their marriage. Yes, even in finding out important news like this, Howard still manages to be Howard (including his comment about Bernadette's breasts at the end of the episode). 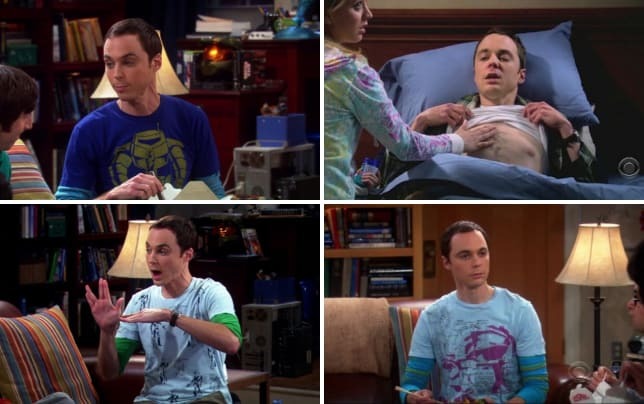 Sheldon: Because this changes everything. What about comic book night? What about playing games together? What about our trips to Disneyland? How can we do those things with a child around?!" It's seems like a silly comment at first, but Sheldon is ultimately right. This does change everything. The group dynamic is definitely going to shift, but that also means more possibilities for all of these characters. It even has Leonard and Penny talking about having kids. Naturally, Howard's panicked reaction causes Bernadette to question everything too. She tells Amy and Penny the news, but she doesn't seem nearly as thrilled as she did when she told Howard. Penny tries to cheer her up by suggesting they go out, but that only adds insult to injury. Go to a bar? Nope. Can't drink. Sushi? Nope. Can't have that either. Relax in the hot tub?? Sorry! No dice! (You can't have deli meat either, Bernadette. Just FYI). Well, the guys DO go to a bar, where they indulge on fruity drinks while thinking up inventions so that Howard can make more money. Somewhere along the line, he becomes more confident, due in part to Sheldon telling him in the sincerest way he can that he thinks Howard will make a good father. That's an important moment too, because it gets at a bond between Howard and Sheldon. They both know what it's like to not have their father around. The guys all drink so much that they decide to do karaoke, and they text the girls to come along. What follows is a montage of karaoke scenes, with everyone singing their own song to Bernadette (usually with the word "baby" in it). It's both hilarious (I laughed out several times while I watched) and sweet. Good things all around. We're gonna be parents! We're gonna get to board planes first! I'm finally gonna get to see what's in that family bathroom at the mall!